Editor’s Note: This is part five of a series addressing the long road to obtaining a village at Killington Resort. Prior articles are available online at MountainTimes.info. In November 1997 IBI Group — a British Columbia-based architectural design firm which designed the Whistler Blackcomb Village — was selected to design the new Killington Village. Over the next five months a public involvement process saw almost 1,000 participants — residents, local business owners, interested individuals, and various special interest groups — attend the dozen-plus design discussions and informational meetings. Concerns and feedback led to several changes in IBI’s proposal, including a more traditional New England architectural design. Local input also led to a special study that focused on the Killington Road. The revised master plan called for a main or primary village in the Killington Golf Course and Snowshed/ Ramshead area, a smaller more upscale village at the Killington Base Lodge area, and some additional development in the 400-acre PUD, the Fosters Peak area, and on one site at Pico. The first priority was identified as the phase one main village and included a potential of 400 hotel rooms, 700 hotel suites, 110 condominiums, 50 town houses, 20 single and duplex homes, 180,000 square feet of commercial space, and 50,000 square feet of public assembly/indoor sports space. A highlight of this village was a core that would feature a pedestrian street with a quiet gathering place like a village green at one end and a more active “forum” at the other. Also included in this phase was a 120-unit hotel for Pico at the entrance area and some units in the 400-acre PUD, which would be lower density dwellings situated in the golf course area. A second village core was proposed for Phase Two at the Killington base area with a primary focus on hotels, both traditional and condo type. Plans also included townhouses, single or duplex homes, commercial space, and public assembly/indoor sports space. Phase Three was conceived as fill-in for the villages and 400-acre PUD as well as at the Fosters Peak area adjacent to Snowshed, with provision for more hotel rooms and suites, townhouses, and single and duplex homes, along with some public assembly/indoor sports space. Carl Spangler, ASC’s vice president of planning and development, stressed the master planning process represented “an attempt to show what the big picture could possibly be for the 1,070 acres and the 400-acre PUD and to disclose that development would only occur on a total of 206 additional acres versus piecemeal or sprawl-type development. “Each phase would have to undergo Act 250 review as applications were made and that would occur in concert with the economy and consumer trends,” he had noted, adding that less than one-third of the original 400-acre PUD plan was built in a 30-year period. Total build-out of the three phases could take up to 20 years or more, pending market conditions, he said in 1998. In 1996 Killington filed an Act 250 application for $10 million in improvements, the first step in a three-year $50 million plan. The Rams Head Express, Needles Eye Express, Northbrook Quad, and two surface lifts were installed. A children’s learning center and the Snowplay Park debuted at Ramshead with handle tow and (first) Magic Carpet as a major Ramshead Lodge expansion created spaces for Family Center/Children’s programs. ASC purchased Pico Mountain Dec. 6 and Pico became skiable on a Killington lift ticket but retained its own lower priced tickets and passes as well. Programs included the introduction of Perfect Turn clinics (created at Sunday River) and free, guided shaped ski demos were offered. A fan of rail service, Otten also had Killington support the new Ethan Allen Amtrak service to Rutland (December, 1996). In 1997, construction of the Grand Hotel began and the trail to Pico was cut to bury the pipeline to transfer wastewater up over Ramshead and down to Pico, where former leaders had previously facilitated the construction of an Alpine Pipeline to carry Pico Village wastewater to Rutland where a treatment plant had excess capacity. When the planned Killington-Pico Interconnect area got held up by permit appeals in 1997, Otten arranged for the K-1 gondola to replace the Killington double chair. Two halfpipes were built on the base of Highline trail and a family fun center debuted there with lights and tubing. A pedestrian bridge was also built over U.S. Route 4 to connect a parking area with the Skyeship base station. Among 1998 improvements: two Yan detachable lifts (Snowshed 3 and Golden Express at Pico) were replaced with Poma detachables; the discovery center at Snowshed debuted; the Grand Summit Hotel and Conference Center opened with a pedestrian bridge across Snowshed Pond connecting the hotel to the slopes; and 300 tower snowguns were added. Heeding the “merger mania” trend, Otten had taken ASC public on November 6, 1997 ($18 share) and acquired the Canyons (Utah), Steamboat (Colo.), and Heavenly Valley (Calif.). Poor snow seasons and a decline in skier visits in 1998 to 2000 coupled with ASC’s growing debt meant cash flow was now going to other ASC projects like the Canyons and not back into Killington projects. Meeting with poor snow winters, an economy heading for recession in the dot-com bust era, and his own over extension of ASC by taking on too many ski areas too fast and building too many hotels during merger mania of the 1990s, Otten had both created the largest U.S. consolidated ski company as well as built up several of the country’s most valuable ski areas while incurring tremendous debt. The impacts from holdups to the permit (1997-2000) for the water withdrawal from Woodward Reservoir and for the interconnect (never built) parallel the permit appeal that Killington had faced from 1986 to 1990. By the time the Supreme Court had validated Killington’s permit to dispose of treated wastewater into a reclassified C Zone in the Ottauquechee River in July 1990 times had changed. Vermont was experiencing poor snow winters and with the country in a recession and skier visits flat nationwide, Killington management could not see their way to forge ahead with completing their village as planned. So as S-K-I Ltd. looked at other areas for growth, they had come to the attention of Otten who had seen the opportunity to “be the one to take Killington forward,” as he had mentioned to me in a 1988 interview. Ironically, Otten had soon faced regulatory hurdles at Killington that held up and then stopped his plans as similar economic and weather constraints hit the area and his company. But in Otten’s case, poor snow seasons, escalating interest rates, and the economic downturn had caused ASC stock to sink to $3 per share and the need for a cash infusion led to Oak Hill Capital Partners investing $150 million in ASC in 1999. That mistake led to an untenable situation for Otten and caused him to leave the company in 2001. It also led to the breakup of ASC as Oak Hill became its majority owner and, wanting its investment back, instructed executives to sell the entire company or areas, one by one. “I have a limit to my patience, too,” he noted, saying he would have come down on that point just as Pres Smith had when pushed in his years at Killington. “My attitude was let’s get the deal done. But then we go back and say here’s a few things I can’t live with. I can’t be responsible for traffic and economic development. [Traffic permit conditions had nixed the purchase of Pico under Smith’s tenure.] The state has to be responsible for civil infrastructure. “Pres had a vision and then he was willing to sell to the next guy. I was the next guy. I could give up Parker’s Gore,” Otten said, but “The interconnect was vital to growth long term and the Village was needed for growth and prosperity. Looking back I was somewhat naïve as to the difficulties to move the Village forward. There were still roadblocks, constant roadblocks. . . .
“The vision was right with the new lifts and doing away with crossovers. The skier visits started to rebound. I was building on Pres’ vision with the terrain between Pico and Killington. We needed the Village to execute all the pieces,” Otten continued. “Every possible iteration was discussed and on the table. It was a dance. We knew what we had to give up. “We bought Pico and we made that trade. The naïveté, if any, was that it would take time,” he explained. “We’re out six years and ultimately we ran out of time and money. The extreme end of environmentalists know if they can delay you long enough, you’ll run out — our pockets were not deep enough to hang on long enough. We tried. We put in money but were unable to get a return on investment. “The only thing we could do was the hotel, but they wouldn’t let us put in a lift to the other side of the pond. We ran into the same walls that Pres did. We did what we could do,” Otten said in closing. 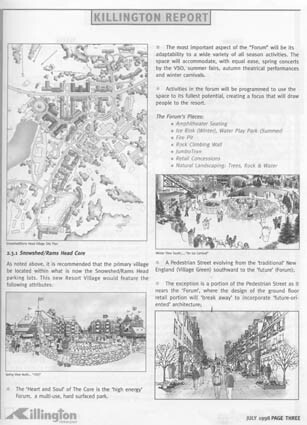 This Killington Report shows a village page of the master plan from July 1998. The ski areas out west have become glorified shopping malls as a result of similar development. While people in the area myself included would like to see improvements that make various terrain of the mountain more accessible such as the interconnect all improvements should be done with consideration for the longer-term impact on the state which prides itself on our beautiful natural terrain. One thing Killington could do to an area that is already developed would be to install solar powered lighting for night skiing on the lower part of Pico. Previous market analyses of this idea showed it wold not be profitable but those investigations were done well over 20 years ago according to conversation I had with Chris Nyberg when he was here. The greater Rutland area has changed tremulously since then and night skiing would be an option for people coming from out of town not just on Saturday night but on Thursday or Friday nights too.